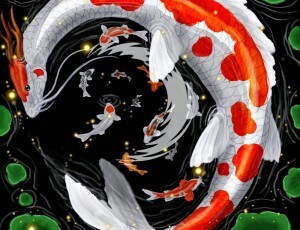 Butterfly koi are also known as the dragons of the pond world! For the koi purist, the kichi, the sleek and flashy butterfly koi may not be their first choice when it comes to their koi collection. For many, the butterfly koi simply would not be an option at all. When you get into the upper echelons of finer koi keeping, the butterfly varieties are barely even recognized as being a fish! Yet, for so many others they would not think of their collection as being complete without some sort of representation from the butterfly variety. My koi collection would fall into that category as well since I can account for 3 butterfly koi in my pond’s population. However; in my pond, I refer to them as dragon koi. I like the name dragon koi better. The long fins on my fish coupled with the swishy manner of swimming they have, actually makes them appear to be much more like little water dragons swimming through my pond than butterflies. But that’s just me, you can call yours what you like but in my pond they are dragon koi all the way! I was first introduced to butterfly koi while still working primarily in the aquarium trade. In the late 80’s my hobby, or rabid obsession, of fish keeping began to greatly affect my income as a Park Ranger at the time. My fish keeping “hobby” was starting to become expensive; a bit too expensive for a Park Ranger’s salary. It did not occur to me to curb my fishkeeping, instead; I started selling myself to the aquarium trade support my habit, I became a fish industry worker, and I used this second job a way to finance my “hobby”. Ironically my obsession grew into something that my then 2 jobs couldn’t support. Those were the good ol’ days, and in those days it was when I first came across butterfly koi, a relatively expensive fish that did not help my plight. I remember receiving and unpacking a shipment of koi. At first I thought something was wrong with them as I had never been exposed to this variety of koi; really, my experience with regular koi was not all that deep at the time either. But the butterfly koi were cool and they sold well. To my eye they were not as “sharp” looking as the straight fin koi, but I still liked them and it was an easy sell. Along with the new butterfly variety came questions like where did they come from, why are they called butterfly, and are they worth a lot? It seemed that the background information on butterfly koi was a bit shaky and unreliable and most of what I thought I knew about them back then was not accurate. Probably the first thing that I needed to learn was that the butterfly variety in no way holds a higher value ($) than traditional straight fin koi, and they never will. They do not win Japanese koi shows, and they never will. Even today, a couple decades later there is a shroud to the information associated with butterfly koi. In more recent times I ran into an industry friend of mine, Shawn McHenry while I was out in Chicago for an industry event. Shawn is from Mystic Koi in Upland, CA. We met for a couple of local brews on the famous Navy Pier while Shawn was moonlighting as a body guard for Mr. Eric Triplett, The Pond Digger. I followed up with Shawn by telephone to get some of his insight on the ever mysterious butterfly koi. We discussed some of the relatively short 20+ year history of butterfly koi including where they came from. I had heard lots of theories of intense breeding, strange feeding practices, and something that involved chicken blood, but none of them were true. The butterfly koi history is not very glamorous in that they were likely a basic river carp pulled from a drainage ditch in Indonesia and then selectively bred into what we know as butterfly koi. The carp fish that likely started it all was the result of cross breeding that resulted in somewhat elongated fins. In many respects a defect, a trait that represents a liability to wild fish. However, this trait had some interesting results that could be brought to market in the aquarium and pond trade, and the “butterfly koi” was born. But the name! What about the name? Why butterfly? As I said earlier, I much prefer the term dragon koi, or simply long fin koi, but I’ve even heard them called American koi and that is just nasty. But legend has it that the term “butterfly koi” was indeed coined by an American breeder Wyatt LeFever. LaFever started interbreeding this new long fin variety with metallic koi and commercially produced the first long finned koi, or butterfly koi. He claimed that because of this variety’s genetics being closer to wild carp they had better tolerance of high and low water temperature extremes. This close link to the wild carp brings some problems to the table as well. Shawn explains that because of pure blood lines going back a hundred plus years for many of today’s high quality koi, the butterfly will not be able to achieve excellent conformity (body shape and balance) which is extremely important in traditional koi judging criteria. The Butterfly is heavily bred in Malaysia, Thailand, and Vietnam; and they are bred more for quantity than quality. The techniques to create the elongated fins can be achieved by stunting the body growth of these fish while encouraging growth of the fins and tails. The overall growth of the fish even when reaching its final destination pond will be a very slow growth rate for the life of the fish. This will often end up with an interesting looking fish marketable in the US, but not so popular in Europe and all but shunned in Japan. The butterfly cannot even be judged by any traditional means because of the typically more sleek bodies and the highly variable fin lengths. 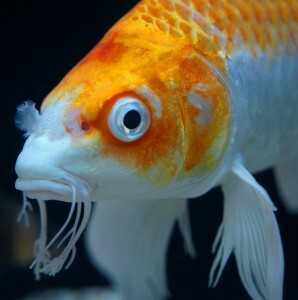 In other words there is no conformity to the koi, therefore making them “unjudgeable”. In a pond environment the butterfly koi mix just fine with the straight fin varieties, as well as comets, shubunkin, and many other popular pond fish. They stand out from traditional koi not just because of their dramatic fins, but also how they swim which seems to need a bit more energy than their straight fin counter parts. The butterfly accepts typical koi food offerings and do not require any special diet. And as far as I know there are no food formulas that help to enhance their fin growth. The butterfly variety can get pretty large, but rarely seem to reach the proportions of the straight fin koi. It seems to be appearing less frequently, but the butterfly will also have growths around the nostrils like little pom poms, and the barbells around the mouth are elongated compared to straight fin types as well. From what I’ve been told color fixing on butterfly takes some time to stabilize while they are growing. It is still unconfirmed, but it is said that the Butterfly variety are less susceptible to bacteria, and that may be possible, but the claims of resistance to parasites is likely way overstated. I actually could see the long fins representing something of a inclination towards parasitic problems. The butterfly trait is what Shawn calls a modifier, and I agree, it is not a stand alone variety, but the trait can be bred into true varieties the same way the Gin Rin quality can be bred into different varieties. Butterfly koi, small ones at least, do have one distinct advantage over straight fin traditional koi in that they will fare somewhat better in a large aquarium, but ultimately need a pond to thrive. The butterfly also makes for a more interesting display in an aquarium being that the breeding objective with butterfly is to have showy fins, and in a fish tank it makes for quite the display. As with any koi though, their aquarium stay should always be considered temporary, as a pond environment is the best choice for any type or variety of koi. I will also add that as an avid enthusiast of koi I have come across literally thousands of butterfly koi over the years and can say with all honesty, and a bit of surprise, that I can count the amount of butterfly koi that have stopped me in my tracks with their beauty on one hand (or less). My preference, without doubt, is straight fin koi. However, I have not snobbed to the point of being unable to appreciate the butterfly variety. I find that truly beautiful butterfly koi are a rarity that occur once every other blue moon. In the US it is fairly common to see Butterfly displayed at koi shows and to date that is where I saw the only truly outstanding butterfly I have seen. This fish was kind of tan/beige/chocolate in color, nothing wild, but I think that monochromatic coloration helped its beauty because its fins were amazing. The fins were well balanced and this fish used them all, and kept them open, practically showing them off, for all to see and admire when most butterfly have a somewhat clamped fin appearance. This fish was awesome and looked every bit like a dragon koi should!! That’s right dragon koi. The popularity of the butterfly variety is not going away anytime soon either; I think they are here to stay. As time moves forward we will also see criteria start to be developed for the judging of the butterfly varieties, and we will also see that it will not be adopted in Japan…ever, and that is ok with me. Hobbyists will keep submitting their butterfly to shows, so if the demand is there, the criteria for judgment will be developed. I am sure someone is already well at work on the criteria already. So the Butterfly variety is here to stay, and I welcome them. If you enjoy them, as many do, take your time picking yours out so you get just the right one. Some believe they are the most beautiful fish in the world, and with beauty being in the eyes of the beholder, who is to say they are wrong. If you are ever in the Uplands, CA area, be sure to stop in and see Shawn McHenry at Mystic Koi. Shawn has some beautiful koi in stock. Visit the Mystic Koi website at www.mystickoi.com. And if the day ever comes for a vote please support my campaign for the name of butterfly koi to officially be changed to DRAGON koi. My water dragons will thank you.